KFC’s new sandwich seems like a joke you’d find on This is Why You’re Fat. 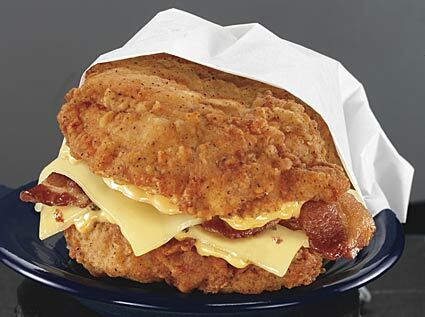 They’re actually selling this in some markets right now – a sandwich made of breaded chicken, bacon, and cheese. I can feel my arteries hardening just looking at it. yeah, but it does look yummy. maybe once a year it'd be worth the risk. but then I try only to eat fast food once a year.